I've had the Card Positioning Sketch 95 sitting on my desk all week - finally had time to complete my card. My finished card is 4" x 4", I used the TJNL Pleated Paper Technique (from CD#6) for my strip of DSP, layered it onto my Chocolate Chip, Dark Racy Raspberry paper from WorldWin, Celery panel then my Chocolate Chip base card. My sentiment is from The Rubber Cafe, I used my SAMJ to stamp it in Chocolate Chip Ink. 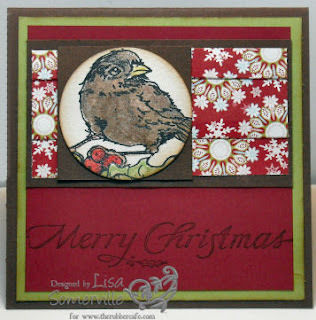 I stamped my Winter Bird from The Rubber Cafe in Archival Black, then colored using my Shimmerz, and punched with my 1-3/8" circle punch, sponged the edges with Chocolate Chip Ink, then layered onto my Chocolate Chip Square, then onto my base card. If you've ever wanted to try Shimmerz - The Rubber Cafe is having a great sale on these while supplies last! Other items are also on sale and they are also offering FREE Shipping on orders of $40 or more when you use code HOHOHO - valid through 12/23/08. 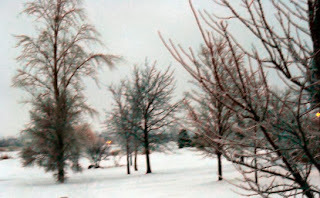 We didn't get a lot of snow last night - as we were South of the Winter Storm - but what we did get was a lot of ice. Most schools around us were close today - both boys however had school. The Junior High has early release as Winter Break begins - and the High School is starting finals today - so they really don't want the kids to get them done. Here's a view out my front door. Nice card. I like that technique. The picture of your yard looks so tranquill and peaceful. Hope the ice didn't do too much damage. Beautiful card! Don't like the ice and snow tho! Sorry about the ice but the white that's there sure looks lovely. I love the fat little bird. He looks slightly guilty like he was spotlighted in your lovely frame, stealing berries from the tree. Very natural and gives me hope that spring will come again. Warm Winter Wishes to you all from Snowy Oregon. Hi Lisa! Love all the card ideas! Yes- don't you love the south of I-80 weather- ugh!!! It has made getting around rather challenging hasn't it? And we're getting more snow today and tomorrow- it is pretty though. Merry Christmas!